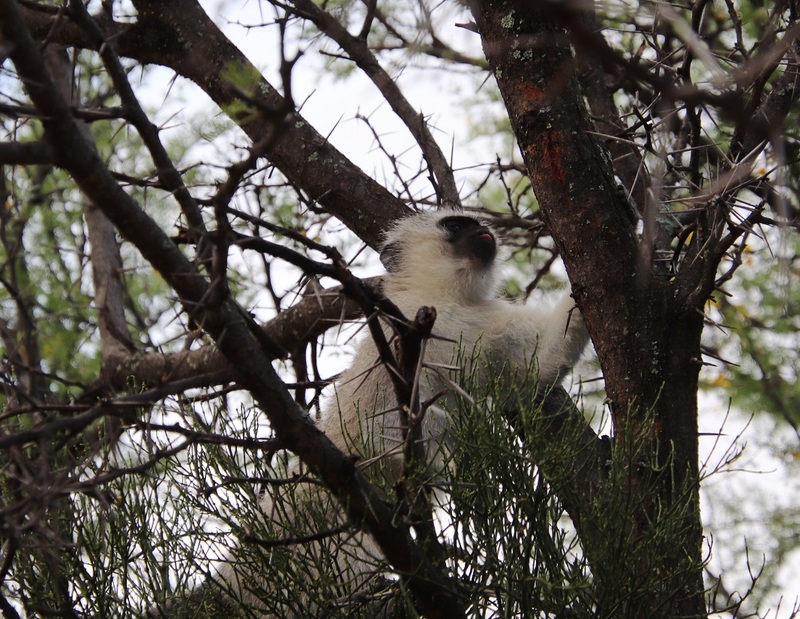 This Vervet Monkey was an unwelcome visitor while we were setting up camp. It leapt down from the trees overhead and made straight for the trailer as I opened its lid. Fortunately all the food was still safely enclosed in covered plastic crates. This action demonstrates how clever these creatures are. I chased it away and kept an eye on it until it moved off to find a more interesting campsite to investigate. Monkeys are everywhere, so one has to be very careful to keep food out of sight and stored in secure containers. Here one is waiting right next to the tent, ready to pounce on anything that has been left unattended. 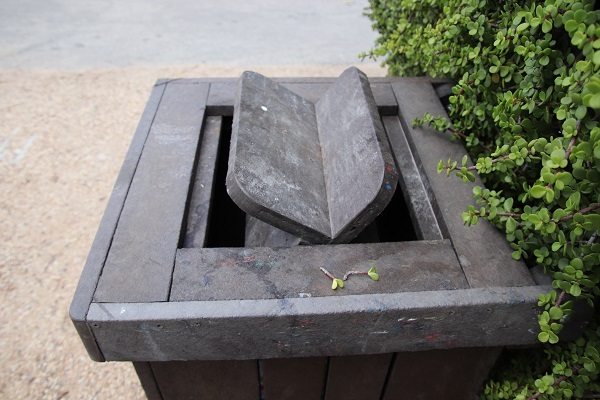 It is so much more fulfilling to see them in their natural habitat. This is when you can watch the interactions between family members and truly appreciate the open affection and care shown by mothers towards their babies; the fun of youngsters playing together; and the curiosity they have for us matched by ours for them. NOTE: Click on the photographs if you want to view a larger image. 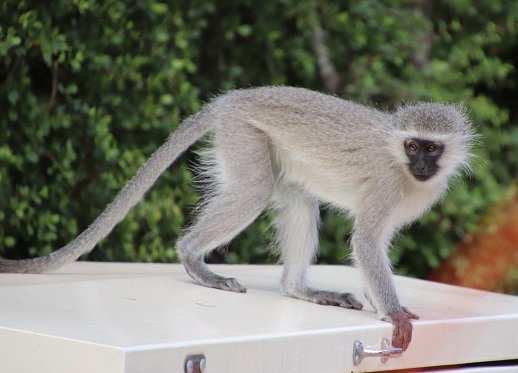 It is almost a given that camping at one of our national parks will involve at least one encounter with Vervet Monkeys. Seasoned campers keep their food out of sight and lock their caravans or tents when they are away from the camping area – be aware that if you do not have a built-in groundsheet, your food remains a target as monkeys know all about crawling underneath the canvas! 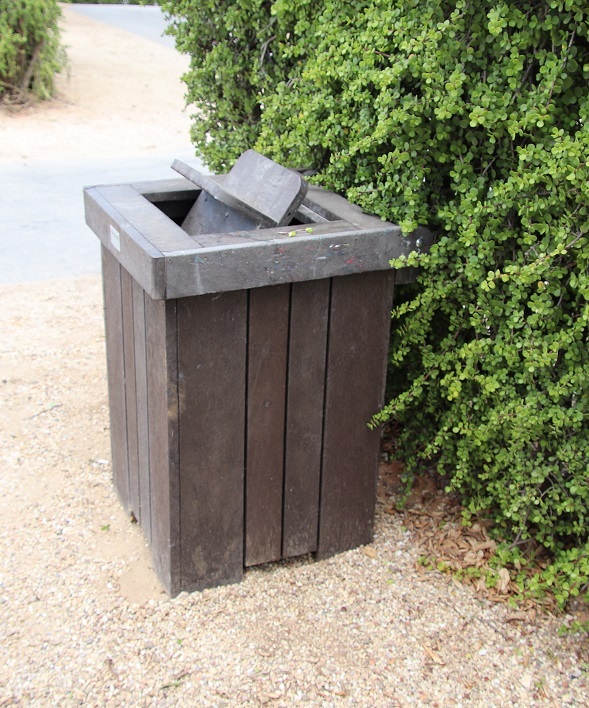 Visitors are warned not to feed them – as ‘cute’ as they might look – and rubbish bins have been designed with a rolling lid to make it difficult for monkeys to pull anything out of them in their quest to find something to eat. 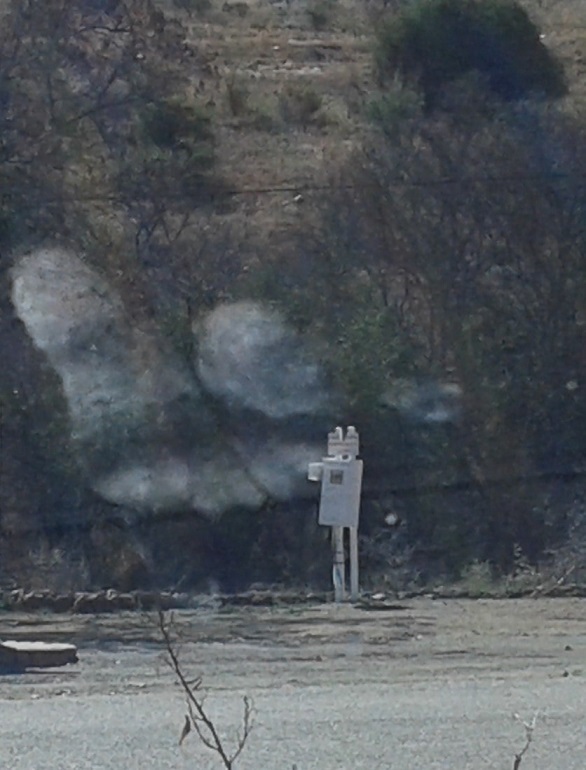 These bins are emptied regularly and every morning someone visits the campsites to clear away the remains of any braai fires from the night before. There is not a great deal more that the authorities can do. 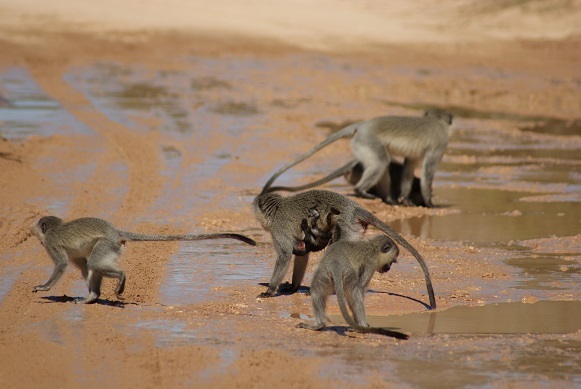 Yet, there must be enough pickings around to make it worthwhile for the monkeys to systematically comb the rest camp for food during the course of the morning and the early afternoons, when the rest camp is very quiet. 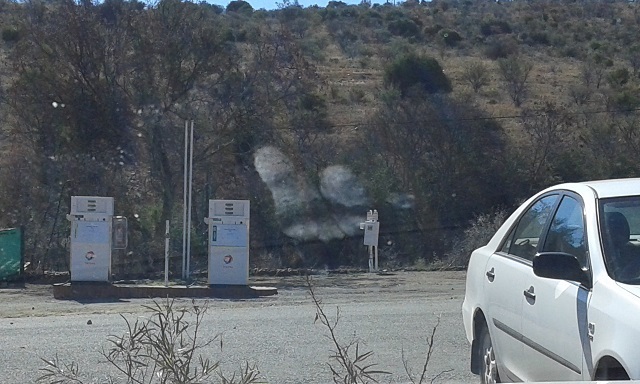 That is when many visitors are driving through the wildlife area, sitting in the bird hide or … resting. 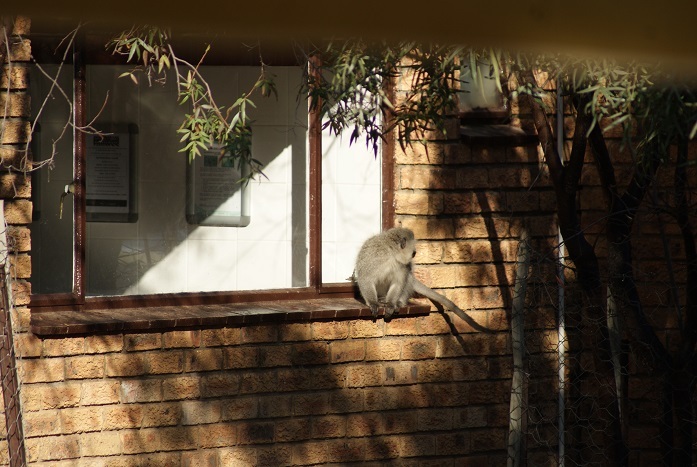 During such a lull one afternoon, I heard of someone’s car keys being snatched away by a monkey; our neighbours found monkeys had entered their open vehicle while they were chatting to other neighbours nearby; and I watched as one by one monkeys would alight on our trailer parked next to a Spekboom hedge. They used the roof of the neighbouring caravan as a lookout point. One of the monkeys had stolen a muffin and sat on the caravan roof to enjoy his booty. It was quickly joined by two others. 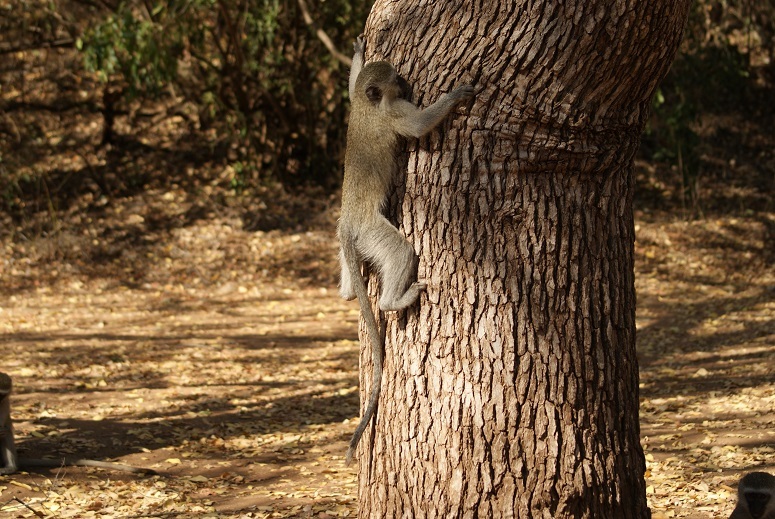 The first monkey was unwilling to share, so leapt up into the tall branches of the adjacent fig tree to eat it in solitude. Seasoned camper that I am, I too fell victim to the monkeys whilst we were breaking camp and the trailer lid was left open for ease of packing: away went a bunch of bananas … away went the remains of the vanilla biscuits I had baked for the trip – they dropped my plastic container though. A blessing – yes, because they are fun to watch; a curse – yes, because nothing is safe from their inherent inquisitiveness! 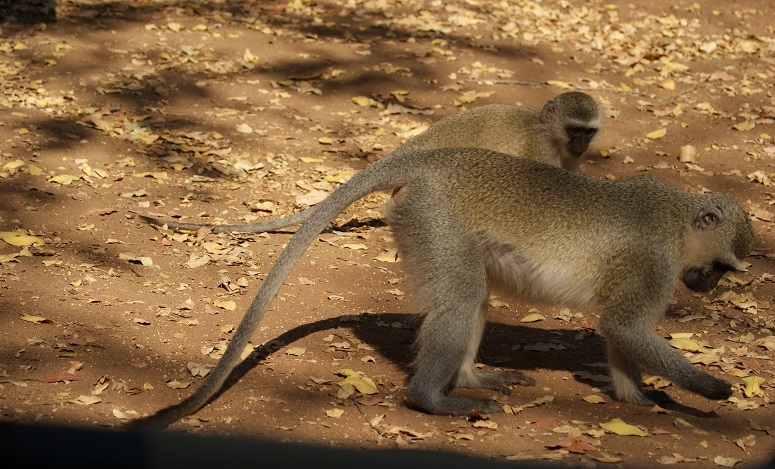 The omnivorous Vervet Monkeys are curious creatures, ready to explore their environment to the full in order to source food. Like Baboons, they are at their best when seen in their natural environment. 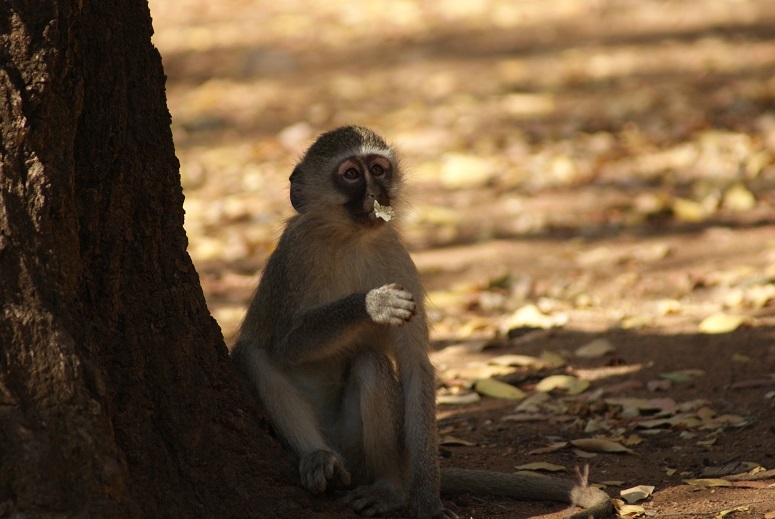 This Vervet Monkey is having a natural snack. 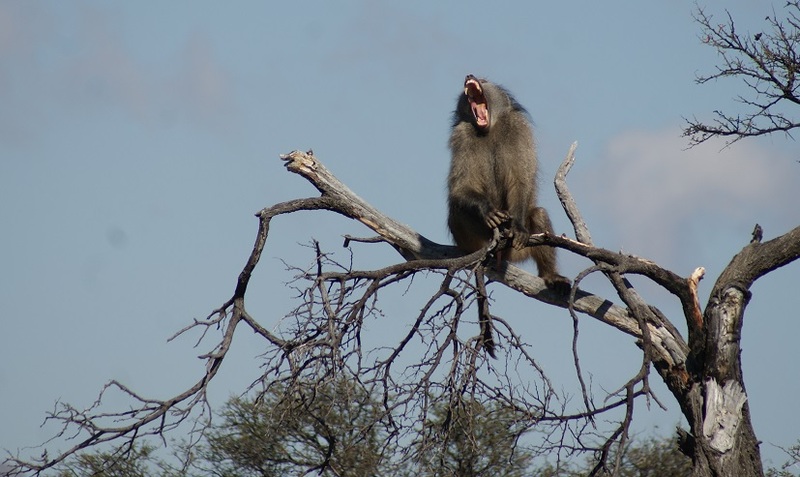 Unfortunately, as is the case with Baboons, the human-like features and behaviour of monkeys bring out their ‘cuteness’ factor which encourages visitors to game parks and popular picnic spots to feed them. 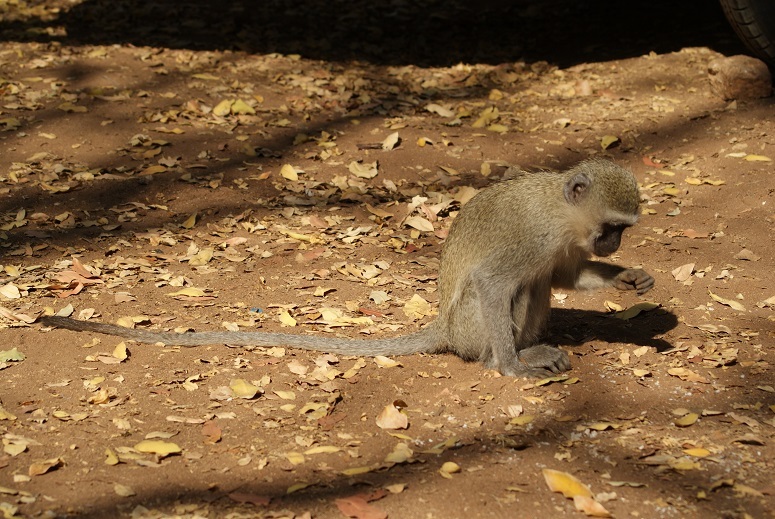 That might be fun for humans and animals alike in the short term, but it is dangerous in the long term as the monkeys come to expect food from humans. 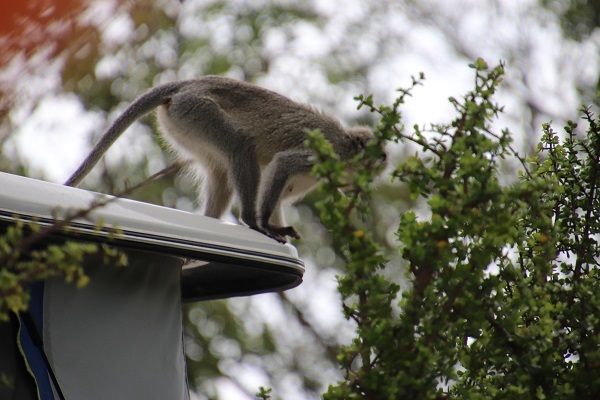 Campers, caravaners – and even visitors staying in chalets – in wild areas have become all too familiar with monkeys raiding one’s temporary living space. 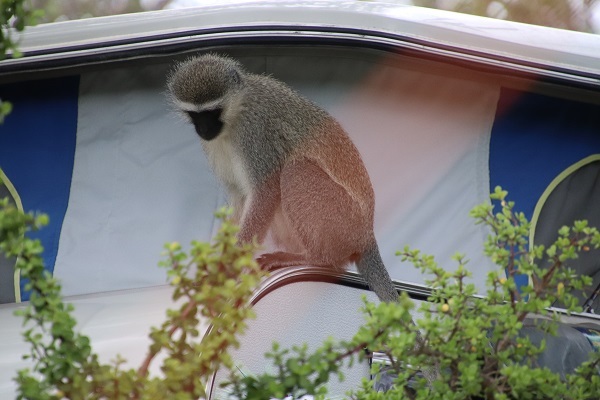 This Vervet Monkey has just been chased from a caravan and is about to inspect the kitchen area in the Mountain Zebra National Park. Their bright eyes pick up anything deemed edible – even the tiny seeds that have been scattered around a campsite to attract birds. Once they have become used to humans, monkeys are difficult to shoo away for they lose their natural sense of caution around us. 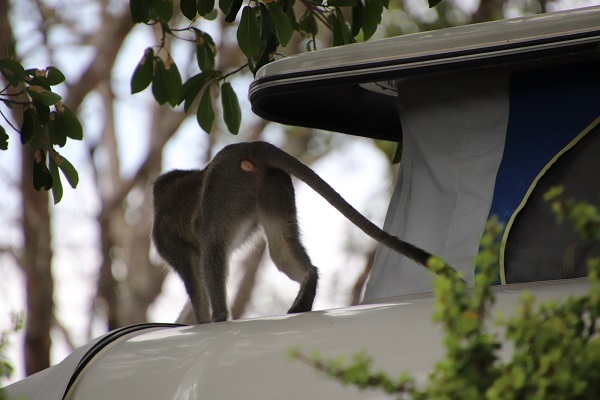 Being the opportunists they are, a group of monkeys happily walked over cars in a car park – keep your windows closed when they are around – to see what they could filch, leaving tell-tale footprints in their wake. Drinking from the puddles in the road. Note the baby tucked under its mother. 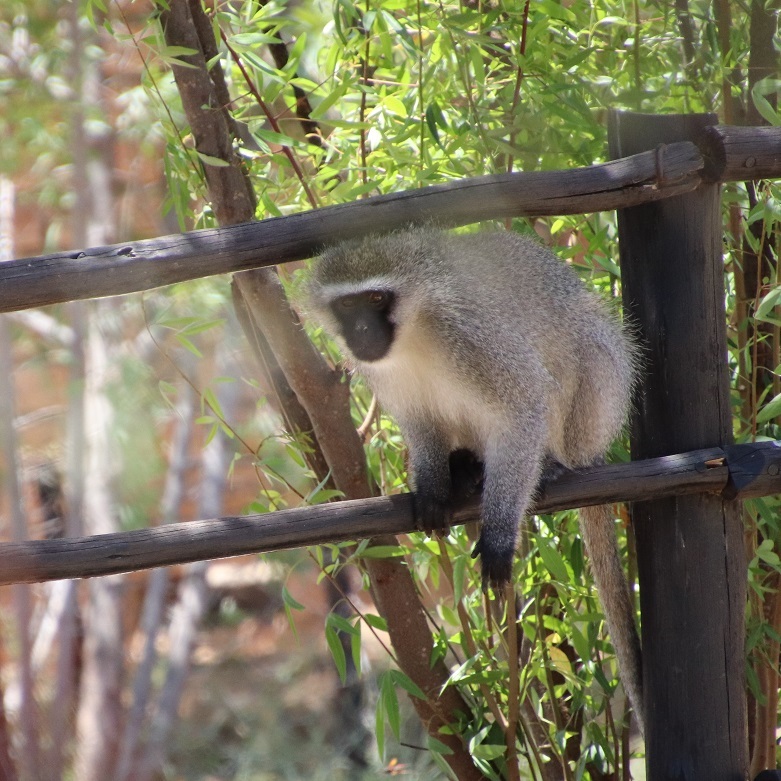 We passed several troops of Vervet Monkeys sunning themselves at the side of the road as we drove to the Mountain Zebra National Park. They are interesting animals to watch as they walk along the strands of wire fences with ease or jump nimbly from tree to tree. 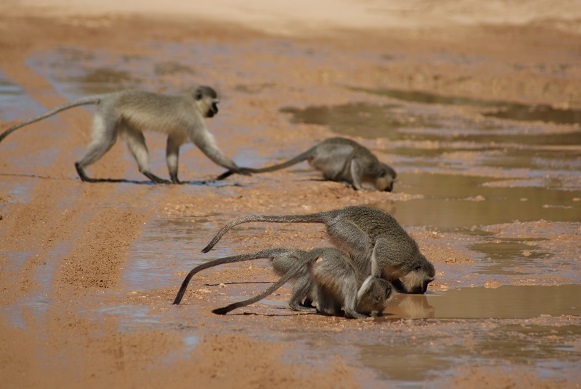 Their habitat includes both open savannah and acacia woodland near a source of water. 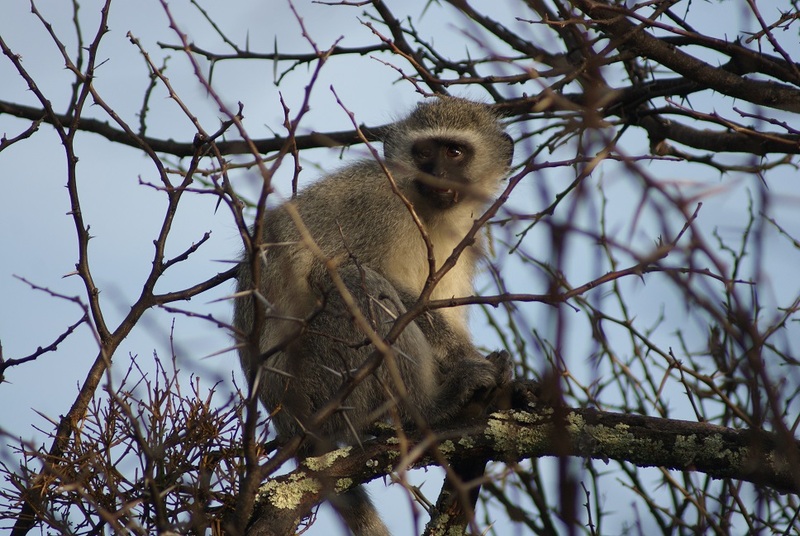 Being omnivorous, Vervet Monkeys are a common sight over much of the Eastern Cape. On our early morning drives through the park we would frequently see several trees covered with them, all warming up in the sun after having endured a chilly night. 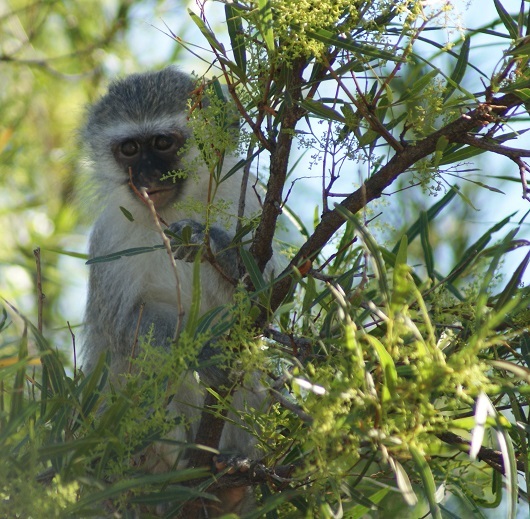 In the veld they are known to eat berries, flowers, leaves and insects – they too were feasting on the termites. 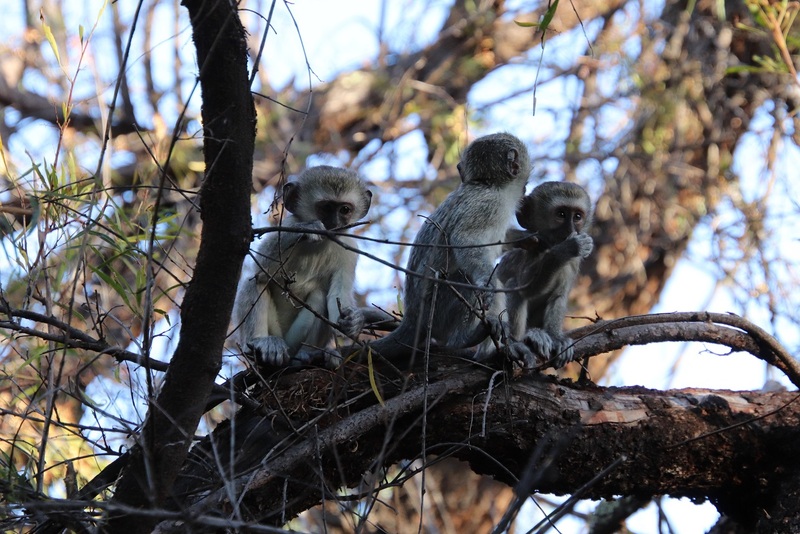 The Vervet Monkeys display many endearing characteristics that, unfortunately, strike a chord with humans. 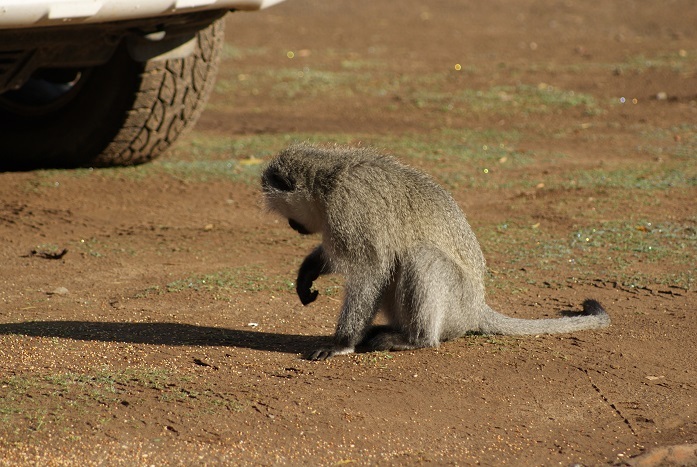 I say ‘unfortunately’ for all too often visitors to game reserves and national parks succumb to the temptation to feed them because they find it entertaining to watch the interactions between the monkeys and the way they deal with the food given to them. The ones living near the rest camp have become used to humans and habituated to eating ‘human’ food. They can thus be a real nuisance, especially soon after sunrise and in the late afternoon for this is when they move in to comb the area for titbits. Despite our presence, one managed to get inside our vehicle while we were unpacking and made off with a plastic bag of food. 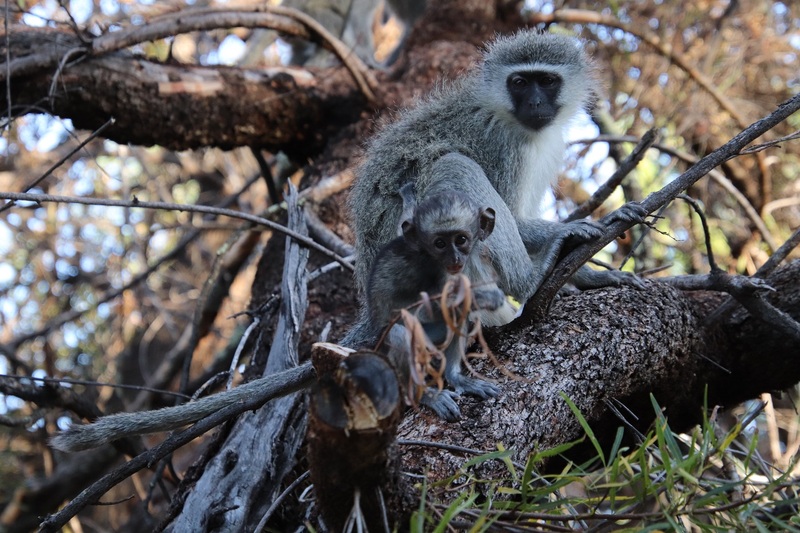 A group of people had just settled down to lunch in the popular picnic site when some Vervet Monkeys brazenly helped themselves to the buns that had just been placed on the table. Signs in the rest camp urge people not to feed the monkeys and to keep the heavy wooden doors of the kitchen and laundry closed in order to keep the monkeys out. The toilets at the picnic site have been fitted with sliding glass doors for the same reason. One dare not leave any food out or unattended and must keep tent and caravan doors closed at all times. Notices in the chalets warn visitors to do the same.